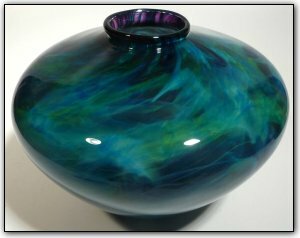 This low bowl features the stunning color combination of luscious blues, aquas, and greens as well as purple accents around the neck. Make sure to zoom in to see just how deep and vivid the colors are, and the way they interact with each other in lacelike patterns. The color combination along with the unique and elegant shape make this a truly unique one-of-a-kind bowl!